The MPA is a MOSFET Power Amplifier. This solid -state amplifier offers 250 Watts of pure power and is available as either a pure power amplifier or as an integrated version equipped with a remote control and motorized volume control. It employs a power factor correction power supply, making it conform to modern power consumption regulations without any compromise in performance. The MPA remains, since its introduction in 2000, an innovative product based on a specific Nagra design. The MPA stands to convince you that a MOSFET based amplifier can convey the emotion and warmness of tubes, in exactly the same way we proved that digital and analogue were not antagonist concepts when serving musicality. As for all audio products, the quality of the whole unit depends very much on the powering stage. This is especially true in an amplifier were the power unit must be able to deliver high current in a short time. In a high power device such as the MPA, the mains itself must provide a perfect sinusoidal signal. As this is seldom the case, the MPA has a specific module called PFC for Power Factor Corrector, placed between the mains source and the power unit. It filters the mains to achieve a true sinusoidal current without spikes (please refer to the article on PFC’s in NAGRANEWS # 16 pg14). The powering unit itself is based on Nagra’s proven quality and expertise in DC-DC converter. In addition to draw a truly sinusoidal current from the mains, the PFC also has the benefit to avoid electrical pollution from the amplifier to the other equipment. This avoids potential electrical hazard for other equipment, and also highly spiked currents that can generate undesirable harmonics and thus significantly degrade the purity and integrity of other devices such as digital and analog source components. The PFC also minimizes the harmful electrical and nasty audible effects of traditional power supply designs. The result is an abundance of pure, natural, uncontaminated power for the most uncompromised reproduction of music, caring for each pianissimo with apropos refinement and delivering every crescendo with supreme gusto. No less than what nature would have prescribed itself. Many of our customers tell us that convenience is every bit as important as audio performance and reliability. 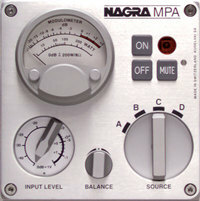 In order to suit your needs, we have designed the Nagra MPA to be available in both power and integrated version. The power version is a stereo power amplifier called MPA, the controls available are ON / OFF / MUTE. The integrated version called MPA-RCMI offers a preamplifier with four balanced line inputs (on XLR), volume and balance control, all available from the front panel and the remote. The same remote can also control the PL-L and the DAC. The performance of the RCMI switcher is exemplary due to its simplicity: it was conceived and designed with the MPA at the outset as a part of the system, and offers a truly dynamic and transparent conduit for input sources. As part of the RCMI option, a high precision, illuminated Nagra meter displays power output for critical setup and monitoring. The RCMI also comes as an option to turn your MPA into a MPA-RCMI. The MPA-RCMI can also be reversed into a MPA. So, whatever your choice in the first place, you can change your options at any time. For systems that need even more power, the MPA is bridgeable (parallel or series). In these modes it is able to deliver 500 Watts into 4Ω in parallel mode or into 16 Ω in serial mode! Some audiophiles will then use two MPA, one for each channel or use both an MPA and a VPA for bi-amplification. In order to fit in your listening room, the MPA and MPA-RCMI are delivered with all the accessories and tools needed to be configured either in a vertical or horizontal position.